Rabbit (DA1E) mAb IgG XP® Isotype Control (Alexa Fluor® 647 Conjugate) #2985 (dashed lines). 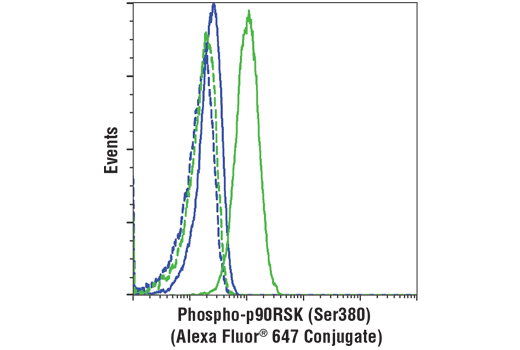 Phospho-p90RSK (Ser380) (D5D8) Rabbit mAb (Alexa Fluor® 647 Conjugate) recognizes endogenous levels of RSK1, RSK2, and RSK3 proteins only when phosphorylated at Ser380 (RSK1), Ser386 (RSK2), or Ser377 (RSK3). This Cell Signaling Technology antibody is conjugated to Alexa Fluor® 647 fluorescent dye and tested in-house for direct flow cytometry analysis in human cells. The antibody is expected to exhibit the same species cross-reactivity as the unconjugated Phospho-p90RSK (Ser380) (D5D8) Rabbit mAb #12032. Upon mitogenic stimulation, p44/42 ERK1/2 and ERK5 MAP kinases cooperatively phosphorylate p90RSK at Thr573 (p90RSK1 numbering) located within the carboxy-terminal kinase domain and at Thr359/Ser363 in the linker region between the two kinase domains (3). Phosphorylation of p90RSK at Thr573 within the activation loop of the p90RSK carboxy-terminal kinase domain promotes activation and directs phosphorylation of Ser380 within the hydrophobic stretch of the linker region (4,5). The p90RSK phosphorylated at Ser380 acts as a docking site for the constitutively active Ser/Thr kinase PDK1, which in turn phosphorylates Ser221 within the amino-terminal kinase domain activation loop, resulting in full enzymatic activation of the p90RSK (6). Antibodies against these phosphorylation sites are useful for understanding the kinetics and regulation of p90RSK activation. For more information regarding the phospho-regulatory sites within each RSK isoform, including more information regarding the seminal studies demonstrating the complex phosphorylation cascades involved, please see the references herein and PhosphoSitePlus® (www.phosphosite.org). Roux, P.P. et al. (2003) Mol Cell Biol 23, 4796-804. Cargnello, M. and Roux, P.P. (2011) Microbiol Mol Biol Rev 75, 50-83. Romeo, Y. et al. (2012) Biochem J 441, 553-69.